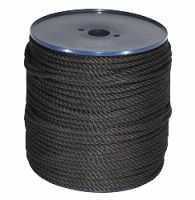 Our multi-filament yacht rope has been designed to offer exceptional working properties - using a three-strand polypropylene construction that enables it to float in water. 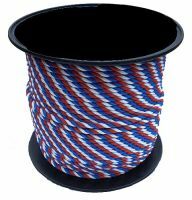 This ability makes it ideal for mooring ropes, fender ropes, anchor lines and towing lines, and we offer a choice of three colours to match your existing rope scheme. Available in thicknesses ranging between 6mm and 16mm we offer our mooring rope by the metre, coil or reel - enabling you to buy as much or as little as you need. Choose from White, Black, Navy Blue or Red/White/Blue and the length and thickness you require, then order now for fast shipping direct to your door. We offer Next Day Delivery to our commercial customers on orders placed before 12pm, and remember to visit our Fittings and Finishes pages to ensure you have all the accessories you need to complete your mooring ropes and fender lines.